Sunday’s column is my second on my visit to Washington, D.C., this one focusing on the site of President Lincoln’s assassination and the place where he died. Have you been to either? Friday’s column is made up mostly of items written in recent weeks that didn’t get into print for space reasons. The bulk are from the past week — a couple are from my vacation — but some of the Pomona Progress items go back to September. I don’t if anyone is reading the paper (or our website) on the day after Thanksgiving but this seemed like a good day to use them, especially since I was compiling the column the morning before Thanksgiving. Enjoy! Monday saw my triumphant (?) return to an Upland City Council meeting. I was there as a show of respect to Brendan Brandt, a councilman for the past 12 years, whose last full meeting it was. Wednesday’s column has my report on the meeting and post-meeting interview with him. 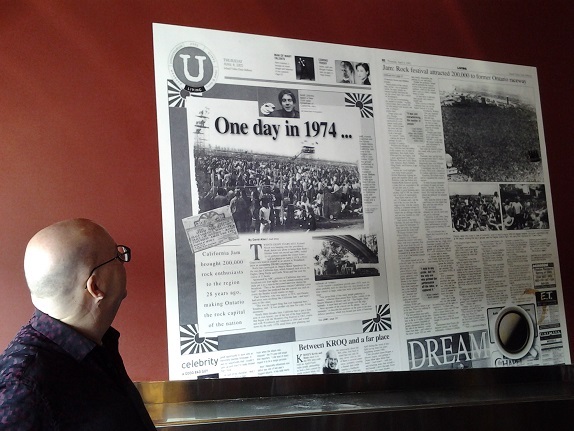 Earlier this year I got a tour of some fun features at Ontario’s Citizens Business Bank Arena as I was researching a column on the rock festival California Jam’s 40th anniversary. I meant to share these photos before now but as they encompass several elements of history, I wasn’t sure how to arrange them and mentally put them aside to deal with later — and, naturally, forgot. Until now. 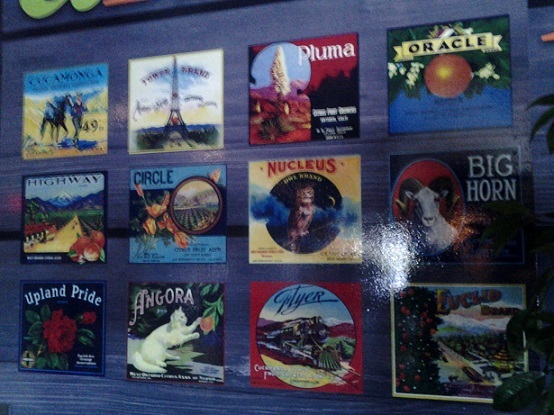 As patrons walk around the arena’s concourse, they might see a display of citrus crate labels that pay homage to the valley’s agricultural past. 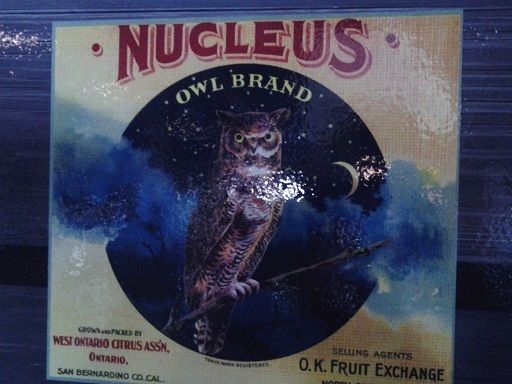 The Nucleus label is one of the most atmospheric I can remember having seen, and Angora is so darned cute. 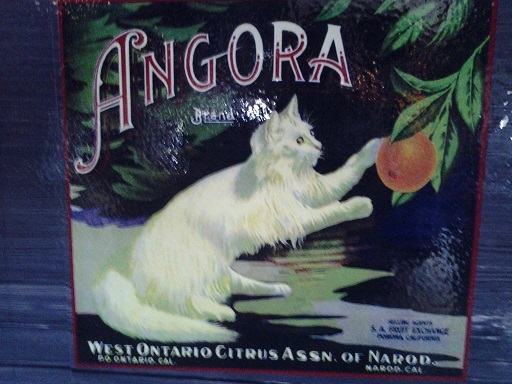 I hope the oranges didn’t have claw marks and cat hair on them. 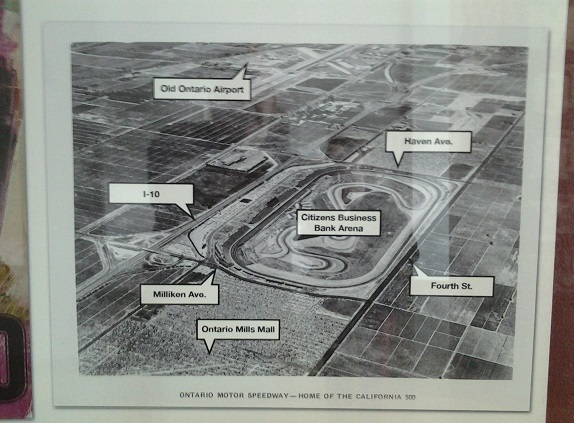 Meanwhile, another wall honors the old Ontario Motor Speedway, which was on land that became the arena and a portion of Ontario Mills. There’s an aerial view with a helpful guide, plus vintage posters and other memorabilia. Finally, there’s a blowup of my own feature story on California Jam on one wall. 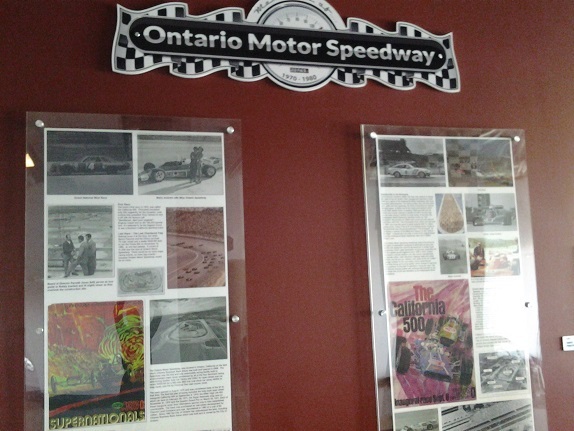 The 1974 rock festival, and its 1978 sequel, took place at the speedway. 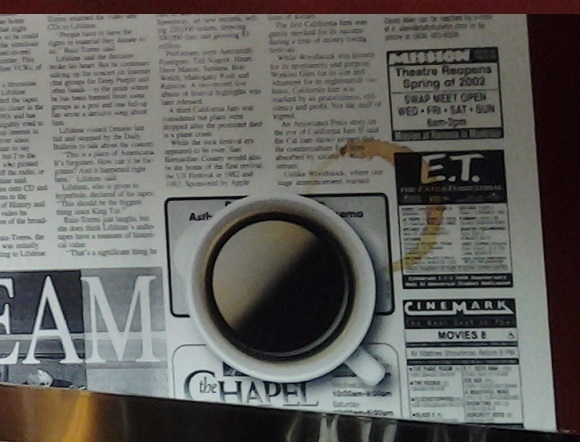 The display encompasses two pages of April 4, 2002 U section, which also includes a portion of one of my columns (not an especially memorable one, but what can you do), meaning that the wall has my byline on the Jam story, my face on my column and a whole bunch of words by me in both. A high honor! I like the touch of a coffee cup and coffee ring on the paper too. The above displays were the brainchildren of Sue Oxarart, the arena’s marketing manager and a local history buff, bless her heart. She’s leaving the arena’s employ but isn’t going far: She’s the new communications director for the Ontario Convention Center and Visitors Bureau. We’ve run into each other now and then over the years going back to the late 1990s and it looks like we’ll continue doing so. News of her new role reminded me of these photos — and I decided I ought to finally produce this blog post before she left the arena! The latest Ontario council meeting is the subject of Sunday’s column. Short story writer and translator Lydia Davis won a MacArthur fellowship in 2003 and a Man Booker Prize in 2009. She’s considered one of the finest literary writers working today. 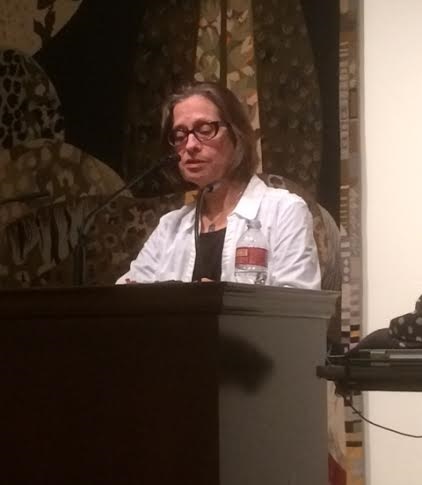 The resident of New York state spoke Thursday afternoon at Scripps College, in something of a coup for Claremont. (Of course, we expect no less from the Claremont Colleges.) I left work early to attend. Nearly 100 people were in attendance, mostly students with some faculty and a few regular folks like me. Most of Davis’ stories are quite short, many only a couple of pages, some so minimalist they’re only a sentence or two long. They’re probably unlike anything else you’ll ever read. She read for 40 minutes, and by my count she read 27 of her stories in that time, all from her latest collection, “Can’t and Won’t,” which has 122 (I think) stories in its 304 pages. Here’s a review from the New York Times. Her stories are often drily hilarious, and Davis’ deadpan delivery in her reading made them even funnier. A few are written as letters of complaint to various companies. 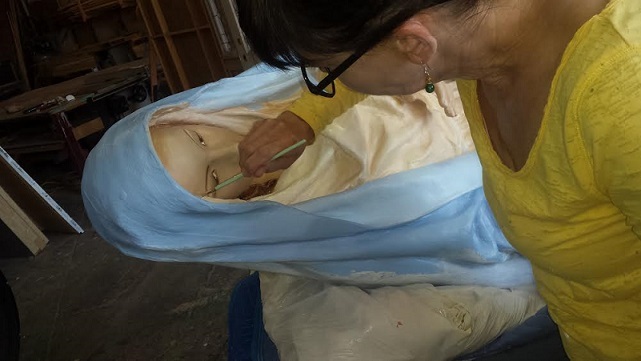 This mode began with a letter she wrote but never sent to a funeral home “objecting to the word ‘cremains,'” she told us. She never mailed it but instead made it a story. Another letter of complaint was to a frozen peas manufacturer, in which she wondered why its packaging made its peas look less appealing than they actually are rather than the reverse. “That one I did send,” Davis explained. “I got an answer but it wasn’t satisfactory”; the company sent her a coupon for a subsidiary’s peas. 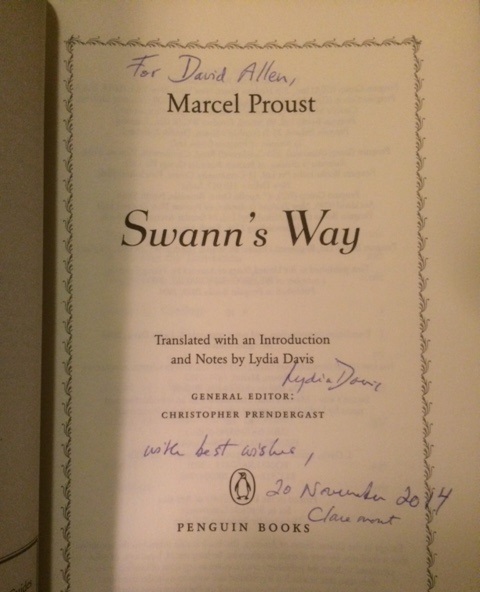 After the reading, I approached Davis for a signature on my copy of Proust’s “Swann’s Way,” which she translated in 2003 for Viking. In a spirit of full disclosure, I have to admit I haven’t read it — I bought it at a Borders during the closeout sale — but now I’ve got extra incentive. I certainly won’t part with it. The first block of the “new Village,” just above the railroad tracks, has struggled a bit, with several tenants having come and gone. Even a cupcake shop failed there. If you’re driving south on Indian Hill and notice a shop over there, it’s too late, because a second later you’re over the tracks and out of downtown. 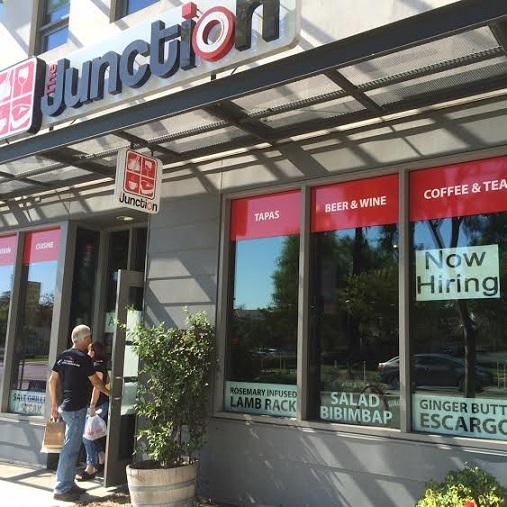 The Junction, a fusion eatery, took over in July from the cupcake shop and half of an organic foods store. “Garlic Butter Escargot” reads one window sign. “Rosemary Infused Lamb Rack” reads another. So they’re ambitious. I met up with a couple of friends there recently for lunch to give the place a try despite wondering if the location might doom it. It’s got a snazzy interior, sleek and modern, lots of block with red accents, a bar and plenty of seating. A kind of light show plays on the entry floor, images undulating like a lava lamp. 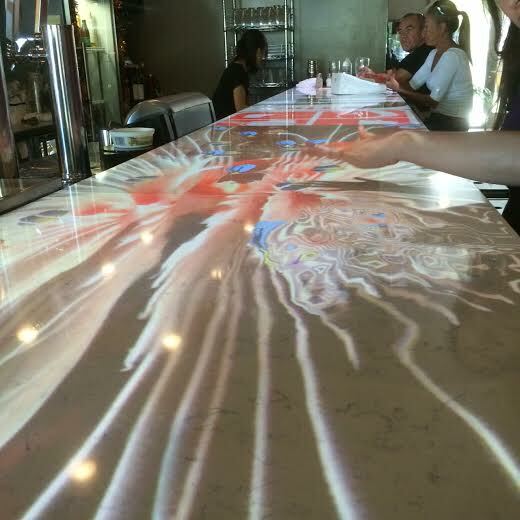 A second version plays on the bar top, and that one is heat-sensitive, so that if you wave your hand over the bar, the image shimmers. 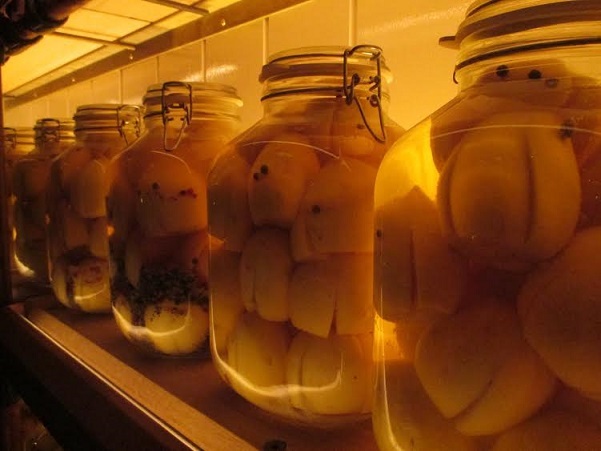 Our server cracked that drinkers find it fascinating, sometimes too much so. The bar, incidentally, serves wine and beer, the latter including several local beers on draft from Dale Brothers, Claremont Craft Ales and Rok House. As for the menu, it’s wide-ranging. They have some small-plate appetizers, a few pricey entrees such as cod, prawns, lamb shank, pork chop and a steak, a New York cut grilled over sea salt for $55. They have a couple of pages of fusion foods, mostly Korean-based, that are lower cost. 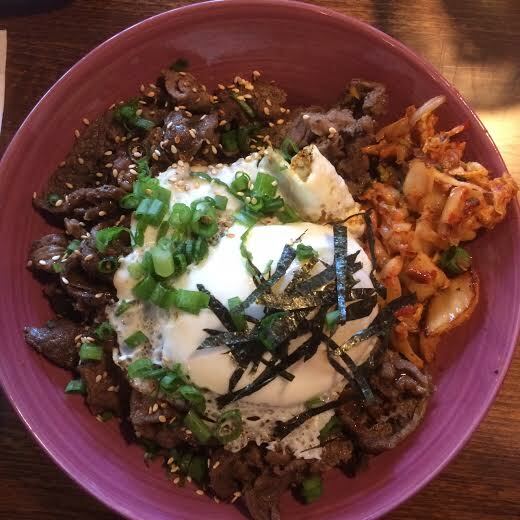 I got the Junction bowl ($9), a bowl of bibimbap (rice, kimchi, green onions and a fried egg) with Korean barbecue beef. I liked it, and it was filling enough that I took one-third of it home for a light dinner. 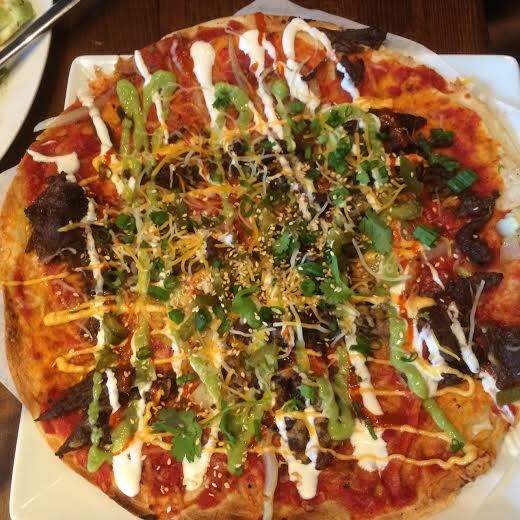 Despite my urging one friend to get the $55 steak, he got a Mexican pizza with Korean barbecue ($9). Some would say this fused one too many cuisines. It had peppers, onions, tomatoes, jalapenos, cilantro, sour cream and more. He liked it, although he didn’t understand why the pizza was separated from the pan with paper, which he ended up partly eating. 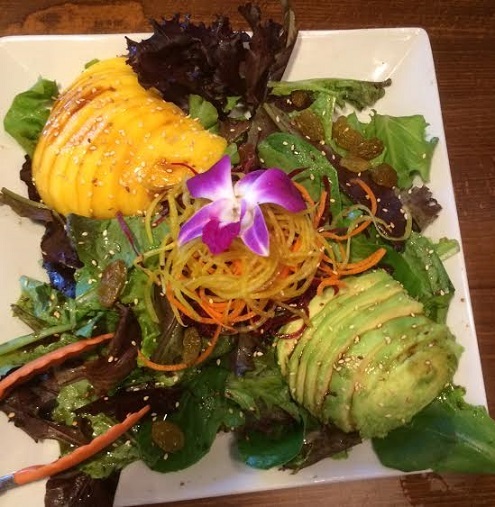 The other friend, a vegan, got the mango avocado salad ($12) and truffle fries ($12). She liked both and was excited to see how many vegan-friendly options there were. “We get options, with an S,” she said, impressed. Our server confirmed, without being asked, that the items were vegan and mentioned several other items that could easily be made for vegans. 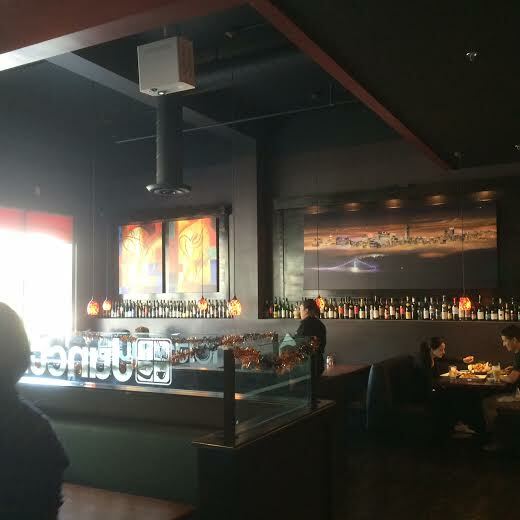 We’d met at noon and when we left around 2 p.m., the restaurant was largely occupied. While I don’t see myself returning for the $55 steak, I see myself returning. Looks like the Junction is a modest hit and may prove that block can field a winner. Anyone making our national pilgrimage to Washington, D.C., has a long list of sites they want to see, or feel pressured to see. I wasn’t immune during my visit there earlier this month, but knowing I couldn’t see the proverbial “everything,” especially in four days, I tried to relax and focus on what I liked most. You can read about that in Wednesday’s column. Upland reader Ann Lara loves her city; she’s the one who leads monthly walking tours of downtown. And so when she visited NYC this month, she made sure to seek out Manhattan’s new restaurant, Upland, named for the chef’s hometown. 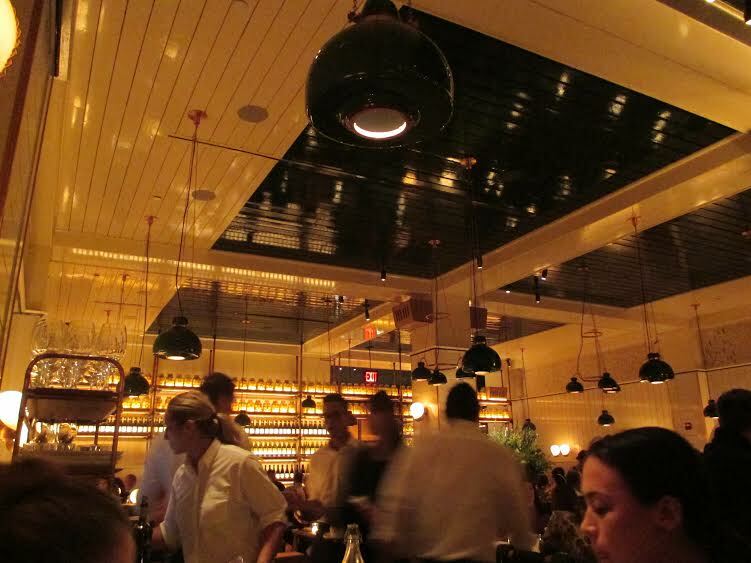 “Great place, great food,” Lara reports. 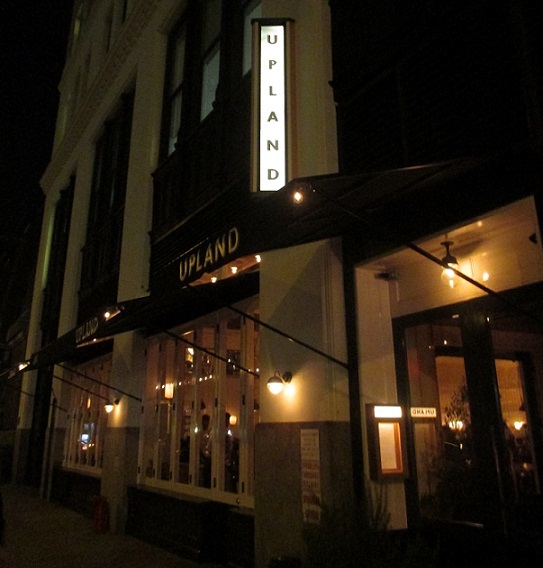 Wearing an Upland sweatshirt for effect, she told someone she was from Upland and got to meet both general manager Troy Weissmann and executive chef Justin Smillie. Sounds as if Smillie could just as easily have named his restaurant Cucamonga, but Upland probably has a better ring to it. Lara told Smillie to be prepared for more hungry, and curious, Uplanders. Ever the Upland booster, she brought along some Upland postcards from the Cooper Regional History Museum for him. 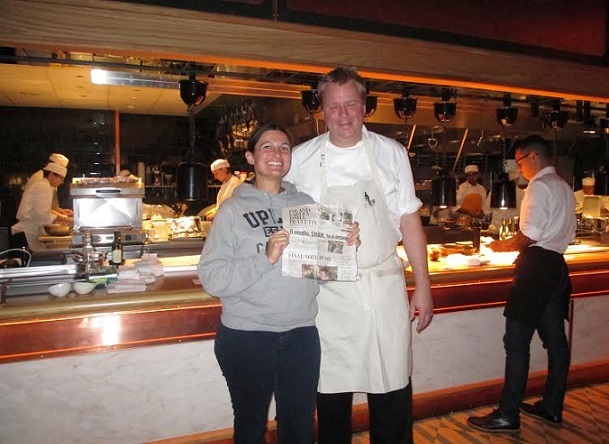 She also brought along a newspaper for a Daily Bulletin on Vacation photo with Smillie.